We’re in the second week of BfA, and my real life has been way too busy for my taste. I’ve mostly been crafting this week, but at the end I decided to focus heavily on leveling, as I realized most players will have rank 3s in the consumable professions when raids open. We’re into the second week of BfA now. This week I had roughly exactly the same amount of total sales as week one. I hit 2.35 million in total sales. The major difference is that I spent way less gold, so I ended up with a profit of 1.33 million gold this week. One of main points is that I did not buy any more BoEs. The BoEs I took a chance on have not paid off at all, and I expect to lose a lot of gold on those. Crafted gear still sells really well. I managed to finish and sell a lot of darkmoon decks this week. At this point it’s mostly the Fathoms deck that’s worth it at rank 2, so I will have to focus on getting rank 3s before doing any more massive crafting. I’ve still been prospecting Platinum, and I spent some time leveling alchemy. I’ve also been buying Battle Potions like a madman as they are still selling for way below crafting cost. There’s a bit of a discrepancy in the TSM summary below, not sure exactly what it is, but my liquid gold went up by 1.33 million. 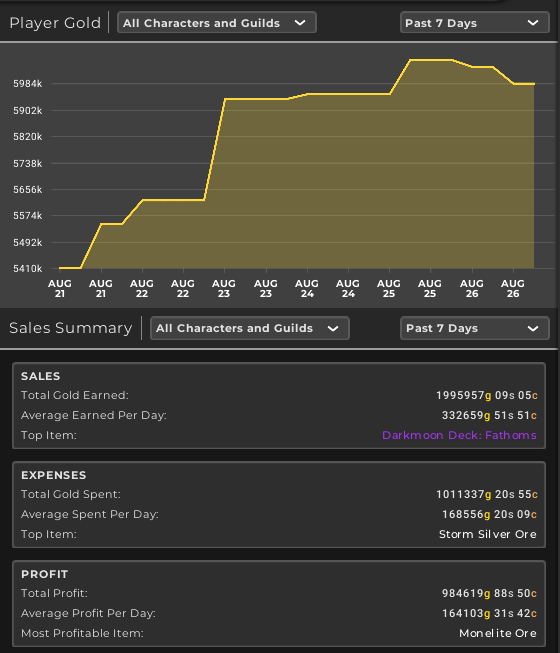 I focused the sales list on the darkmoon deck part. As you can see I’ve sold 10 decks this week. The Fathoms decks are the ones that are pulling the profits. I’ve also sold some contracts, and a LOT of honorable combatant gear. I will have to get Marks of Honor for the recipes eventually, but my focus right now is leveling. Other notable items include the Kraken’s eye gems. The most profitable crafts for me at the moment are the jewelcrafting ilvl 300 weapons. The sale rate is not too fast, but the profit margin is still amazing. We are quickly approaching the raid launch, although we still have one week. My focus now will be to get ready for that by leveling all my 110s to 120 and getting the rep for the most profitable recipes. My warrior is 118, so I will soon be ready to work on Jc and enchanting. Following that I will level my Demon Hunter for Alchemy, then my Mage for Inscription. 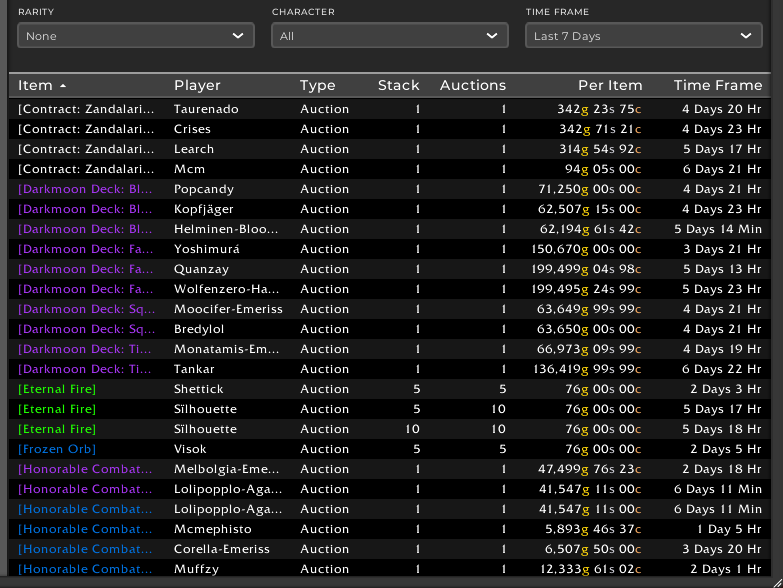 This one will be discontinued until TSM4 re-adds the inventory view. Follow me on twitter and twitch to keep up to date with my challenge. I’ll be streaming my first foray into BfA on Tuesday, so definitely join me then. Hard to say. I’m still in the market, I don’t think the price will ever tank to far below material cost as no one will bother crafting them then. A lot of players will probably have to exit though. I’m in the «wait and see» boat.